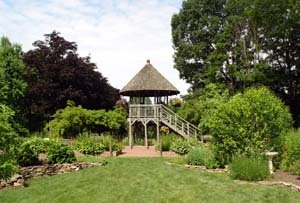 The Hunterdon County Division of Parks & Recreations is located on the grounds of the County Arboretum. Restrooms are available only during office hours. Parking is provided in the lots on either side of the building for 50 vehicles. Parking elsewhere is prohibited. We urge you to consider car-pooling. A Ranger can be contacted on weekends or evenings by calling Hunterdon County Communications at (908) 788-1202. It is the policy of the Hunterdon County Division of Parks & Recreation to provide reasonable accommodations for persons with disabilities upon advance notice of need. Water available seasonally April 1 st through November 1 st.
Groups of 15 or more are required to obtain a permit to use a specific facility. 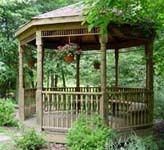 The gazebo, terrace and gardens are popular for wedding ceremonies. A reservation for such allows 1 hour for the ceremony and photography session. Decorations are permitted, but must be removed immediately following the ceremony. Rice, seed, confetti, and releasing balloons, birds, butterflies are prohibited. Wedding size of 100 people or less. Photography sessions alone may be reserved for a one-hour time period. OFFICIAL FIRE CODE CAPACITY: 41 PEOPLE W/TABLE & CHAIRS, 50 PEOPLE W/CHAIRS, 62 PEOPLE STANDING. AMENITIES: Projection screen, electricity, restrooms, fireplace-MUST USE DURA-LOGS. Note: * The use of activity centers and meeting rooms shall be reserved for purposes related to parks, recreation, and conservation purposes. Recycling containers are identified and provided for your use. Room set-up by Hunterdon County Parks Division with floor plan available. Size of table’s 8’ x 2 ½ ’. Any damage to the carpet, exhibits or any other items in the meeting room will be the responsibility of the person named on the permit, and will require repair or replacement by that person. NOTE: Restrooms can be made available upon request. FROM FLEMINGTON: Take route 31 north from the Flemington Circle 5.8 miles. The Arboretum is located at our Administration Building on the northbound side. FROM CLINTON: Take Route 31 south from I-78 for approximately 4 miles. You will pass the Arboretum on the North Bound Lane. Take the jughandle at Stanton Station Road (approximately 1/4 mile south of the Arboretum) to go North on Route 31. The Arboretum will be 1/4 of a mile on the right. FROM I-78: Traveling west take Exit 17 (Clinton-Washington) to get onto Route 31 South. Travel south on Route 31 4.6 miles. Traveling east, take Exit 17 onto Route 31 South 4.6 miles. Follow directions above.